Modern Bikes don't have an ignition system like old bikes. Points and even CDI's are now things of the past. This changes, and sometimes complicates, the whole starting process. Modern bikes seem VERY susceptible to any battery that is not 100%. What I believe happens is this. An old bike created a spark through means not dependent on the battery. I ran my 250 Dream with CDI for years with a dead battery, I'd just use the kick start. The CDI got it's power directly from the coils and it's pulse generator thingy, I just left the battery on to act as a smoother for the electrics. The modern machine uses a computer to manage the spark and when it should arrive. Imagine your laptop, with it's battery. If you removed that battery or the battery was low on power, laptop no runnie. It's the same with the computer on your modern bike. Aha...I can hear dissent from the ranks. There must surely be enough power in the battery for the farty little computer if the battery can turn and turn and turn the engine over as mine has been doing. Yes...and no. When you turn the key the mileage comes up and the needles twitch or whatever your machine does. But when your press the button, a whole huge heap of power goes through the starter motor. If your battery is not tip-top bright and perky, it may send all it's power through the starter and leave the computer floundering. Batteries are not cheap. Always ALWAYS check you've got fuel in the tank. Easy mistake, I've done it myself too often. Check no scumbag has pulled your plug caps off, flicked your kill switch or nailed some other safety feature. So, you've checked all the obvious stuff, now to check the battery. There's no point getting out the multimeter. That battery will read 12, 12.5 or even more volts. It will appear fine. If it were low you'd hear the starter motor running slowly. The only way to check is to jump the bike off a nice fat HEALTHY car battery. Not one off a car that's barely capable of starting itself, but a big one of a merc or something. You know what I'm driving at. Be very careful when connecting, it's soooo easy to short the jump leads against the frame, or get them the wrong way around. If you do either of those things, you may fry the computer, and that will cost a lot more than a battery believe me. If the bike starts, I guess you've sussed the problem. You may try charging the battery but beware, modern batteries like modern bikes are great when they're good, but once they show signs of weakness it normally means it past its best. 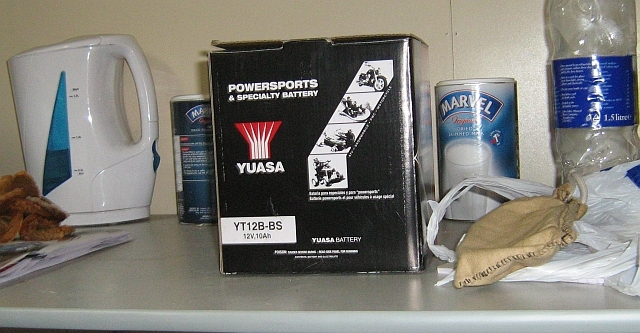 The box my battery came in for the Fazer. £60...i mean £60! Eeee...when I were a lad they were like £12 a pop...I miss them days I do.